I don’t read a lot of sad because because surprise, they make me sad. I don’t like feeling sad; I often feel sad for no reason anyway…I don’t need to make more room in my life for things to make me feel sad. And you would think I would think logically when picking up an Adam Silvera book because guess what, THEY’RE SAD. 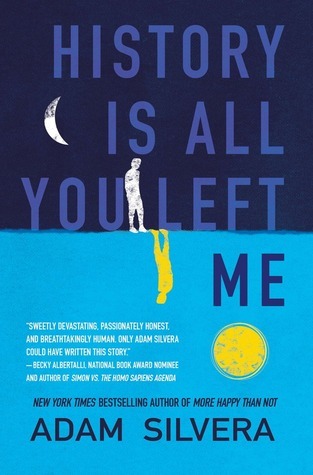 But I love everything about Adam Silvera’s writing because it’s so realistic, and I often latch onto his characters and find something relatable about them. In this case, it was the main character’s jealousy. This has happened before in other books like Isla and the Happily Ever After by Stephanie Perkins and Solitaire by Alice Oseman because there’s just something overwhelming powerful in a book when it feels like it’s talking directly to you. Not to mention while I was feeling all these things, MORE feelings were piled on. It’s not a spoiler to say that the story involves funerals and grieving and memories and it just HURTS SO MUCH. I had to keep taking breaks. Trust me, there were funny parts, and really lovely parts that didn’t make me burst into tears, but to summarize this book into one word would be; heart-wrenching. I’m surprised I haven’t heard about this book. It sounds super sad but sometimes I need that in my life, a little cleanse. Love this review, I’ll have to check it out! It is pretty sad, it’s what Adam Silvera is known for! Great review! Even though it was really sad and at times painful to read, I finished that book in two days. It’s honestly one of the best YA books I’ve read in a long, long time. I admire Silvera’s ability to explore these topics and emotions without ever manipulating the reader. It’s a fine balance but he pulls it off.